Purpose of education and its role in challenging gender and social norms around violence Overview of SRGBVChildren speak out about school violence in KazakhstanWhat are the root causes of SGBV? What are the consequences of SRGBV? What are the costs of SRGBV? What is the timeline of policy commitments and international agreements? What are the main challenges in terms of addressing SRGBV? What are the key programming principles for SRGBV interventions? Formative research, also known as situation analysis, needs assessment or exploratory research, collects background information and data on the SRGBV situation and needs, in order to design policy and/or programming. The issues and processes discussed in this section are also applicable beyond the formative research stage to many types of research. design policy and programming that identifies potential challenges and builds on existing entry points. Formative research can also be used before developing quantitative instruments (e.g. surveys or national data systems) to help identify forms of SRGBV that are specific to the national setting and that the survey needs to address. Consent involves an explicit act, such as verbal or written agreement. Consent can only be given if the participants are informed about and have an understanding of the research. Consent must be given voluntarily without coercion. Consent must be renegotiable so that children may withdraw at any stage of the research process. existing civil society organizations, government actors, and donors working on SRGBV. Step 1: Engage partners. For example, in Liberia, the Ministry of Education and Ministry of Gender and Development joined together with a consortium of non-governmental agencies to form a Research Board. Although the research process took longer, the final product had shared ownership and buy-in from partners. Step 2: Analyse information gaps to help you understand what information you already have on SRGBV and where there are gaps that need to be explored further with formative research. Step 3: Write research questions. The questions, together with your approach, will guide and structure the choice of data to be collected and analysed. Step 4: Choose data collection method – common formative research methods used to understand the nature and scope of SRGBV include in-depth interviews, focus groups, observations, participatory research, desk reviews and surveys. Formative research should ideally combine several of these methods so as to triangulate different sources of information and perspectives. Some examples of how different methods have been used for formative research on SRGBV are shown below. Step 5: Ethical review. Research on SRGBV should take into account a number of ethical considerations, including around confidentiality, anonymity, informed consent and how to deal with mandatory reporting if there are disclosures of abuse that need to be included. Researchers must respect the ethical review processes of the countries in which they are working. Step 6: Develop instrument(s) based on data collection method chosen – for example, an interview guide, a focus group moderator’s guide, a questionnaire, or an observation checklist. Step 7: Recruit participants – formative research on SRGBV presents considerable ethical issues due to the sensitive nature of the topic and the likelihood that research participants will include children and young people. Potential participants, and their parents/caregivers (if they are children), must be given sufficient information to allow them to decide whether or not they want to take part in the research study. The type of information they should be given will depend on the backgrounds and age range of the children and young people involved – all children and young people should be approached with a focus on their capacities and strengths, with the choice to ‘opt out’ at any time. Researchers should respect the core principles of informed consent (see box). Step 8: Collect data – with formative research, the main aim is to collect the best data to help you make well-informed decisions. Step 9: Analyse and report findings in an accessible and easily digestible format. Step 10: Reflect on learning from research for practice and action. In 2005, as part of USAID’s Safe Schools Programme in Malawi, participatory formative research was conducted to understand boys’ and girls’ experiences of school violence. Participants drew an abuse spider with each leg representing the type of abuse that happens in and around the school. 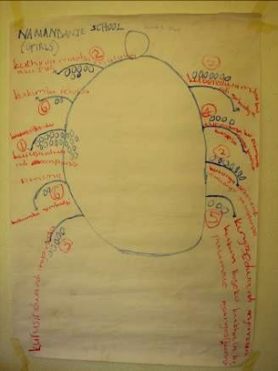 Each pupil in the group then drew an equal number of dots (or placed seeds) to rank the identified abuses according to their perceived frequency and severity. Facilitators did not stipulate what types of abuses constituted SRGBV, but instead allowed pupils to mention all those abuses that they had experienced or observed at or on their way to school. Analysis of the difference between girls’ and boys’ abuse spiders revealed that several types of violence and abuse were gender-based. For example, over half of girls (54 per cent) mentioned inappropriate sexual touching by boys, and almost half (49 per cent) said girls were propositioned by male teachers. The findings from this formative research were used to help raise awareness, involvement and accountability at national, institutional, community and individual levels of SRGBV (CERT/DevTech, 2008). 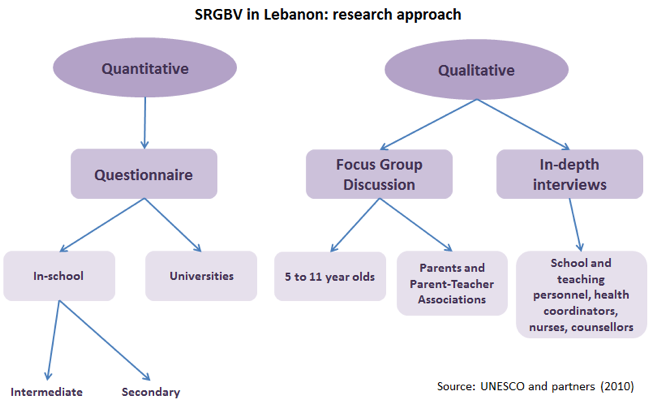 A national study was conducted on SRGBV in Lebanon as formative research for the UNESCO project ‘Supporting Gender Equality in Education in Lebanon’. 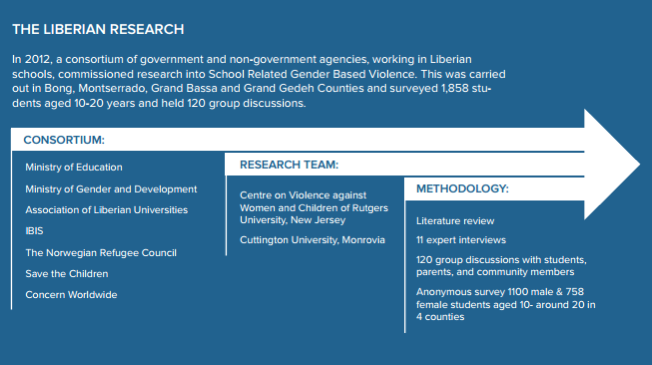 The study used both quantitative and qualitative methodologies to investigate and understand the nature, extent and causes of SRGBV in schools and its effect on all school-age students. Particular focus was placed on the impact of SRGBV on girls and their educational attainment. The study identified a culture of silence around SRGBV, and noted the need to adopt a culturally-sensitive approach and raise awareness through a multisectoral strategy including media, communication and inclusion of specific curricular material (life skills, conflict resolution, GBV) in the school education programmes. The study also recommended that teacher training should include courses that explore ways in which SRGBV should be challenged within schools. In addition, it highlighted the need for a national steering committee, headed by the Ministry of Education and Higher Education, to ensure collaboration between key ministries and among local organizations around SRGBV in Lebanon (Mansour and Karam, 2012).